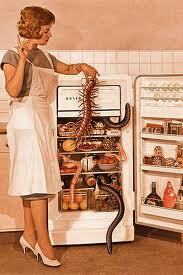 Why it's important to clean out the fridge. OR... How I almost poisoned my kid. There is nothing I like better than looking at the school lunch calendar and finding entrees both kids like. Something about the monotony of making lunches drives me batty. It's nice to break up the morning routine and NOT have to pack anything. It's rare that they are serving something they both like. Handsome will ALWAYS chose pizza, corn dog nuggets and chili/cheese nachos, on occasion he'll also get sliders. Puddin Pop will do popcorn chicken (as long as I send a side of honey), baked chicken or teriyaki chicken and, on occasion, sliders. Hardly ever are they on the same day. One Monday a month they have both popcorn chicken and pizza. That's my favorite day. Friday was an early release day. Looking forward to Spring Break starting, I was oblivious to my normal lunch making aversion. Handsome got his usual PB&J and Puddin Pop opted for Turkey roll-ups with cheese and crackers (only because we were out of Ramen). The turkey looked a little funny. A little darker and a little drier than normal. I knew I had just bought it and eaten some earlier in the week so, I smelled it and decided it was fine. I would have tasted it but, it was 7:30 and I was enjoying a cup of vanilla nut mocha mint coffee. Turkey, good or bad, wasn't going to taste good with that. Lunches packed and off to school they went. I spent the next hour or so doing some chores, or catching up on FB games. You pick. It's not relevant to the story. At a little after 10, I decided to make a salad, which turned into Nachos (also not relevant) when I came across the NEW package of turkey in the salad crisper. Crap. That makes the stuff I packed for Puddin Pop at least 2 months old. Crap. Crap. Crap. I went into panic mode... and I rationalized. If it's bad, she won't eat it. She won't have much to eat but, she gets out at 1:30 so it's not like she can't eat then, right? That reasoning lasted about 2 minutes before I went back into panic mode. I opened a can of spaghetti O's, which I would have packed in the first place if I had remembered buying them. I ran upstairs to put on make-up. Not sure why this was important. I rarely wear make-up and everyone at the school has seen me without. I guess I felt less like the Loser-Mom-Who-sent-spoiled-food-in-her-kid's-lunch with make-up on. I wasn't thinking, I was reacting. I threw the Spaghetti-O's into her thermos, grabbed a spoon and ran out the door. Being it was an early release day I wasn't sure what time her lunch was but knew it was already happening or happening soon. I showed up in the office at 10:35 and saw kids already in the lunchroom. I announced I was there to have lunch with my daughter and asked when they ate. 10:40. They would be down any minute. What could have been an ugly experience for PP, turned into a Mommy and Me lunch date and a lunch replacement that was even more pleasing than the original. We had a great time and she LOVED having me join her.